Certified copies of marriage certificates in Park County can be obtained from the Clerk's office. Information is available at http://www.parkcounty.us/countyclerk/marriageinfo.htmlthe fee for a certified copy is $5.00. Statewide reporting of Wyoming vital records commenced in 1909, 19 years after it was granted statehood. Birth records are sealed for 100 years; death, marriage, and divorce records are sealed for 50 years. Records in the public domain can be obtained from the Wyoming State Archives at http://wyoarchives.state.wy.us/. 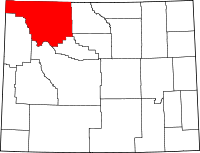 Park County was created in 1909 and was named for Yellowstone National Park, which is mostly within the limits of Park County.